A family illness is the impetus behind this employee resignation letter. 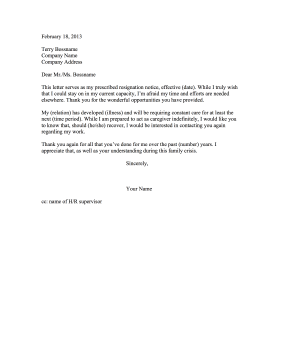 This letter serves as my prescribed resignation notice, effective (date). While I truly wish that I could stay on in my current capacity, I'm afraid my time and efforts are needed elsewhere. Thank you for the wonderful opportunities you have provided. My (relation) has developed (illness) and will be requiring constant care for at least the next (time period). While I am prepared to act as caregiver indefinitely, I would like you to know that, should (he/she) recover, I would be interested in contacting you again regarding my work. Thank you again for all that you've done for me over the past (number) years. I appreciate that, as well as your understanding during this family crisis.